We stood hand in hand in a big circle around the room. Over 30 women from different walks of life. 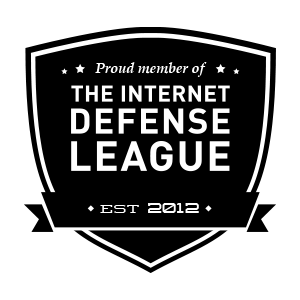 Some with loss still waging war on their souls…. I stumbled into this group on accident. I was asked to share a devotion at KARM’S Serenity Shelter. How these women press on is nothing short of a miracle out of GOD’S playbook. My heart was so excited to return this month to celebrate Thanksgiving. 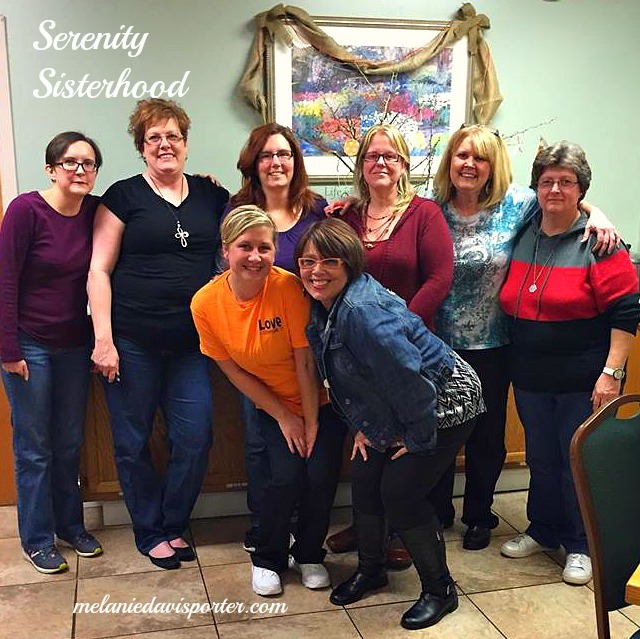 A precious sisterhood of women from our church have been going for months to love on this magnetic group. And yes my heart is now knit to these special women who have been serving faithfully. We do simple activities, play games, eat, laugh and pray with them. 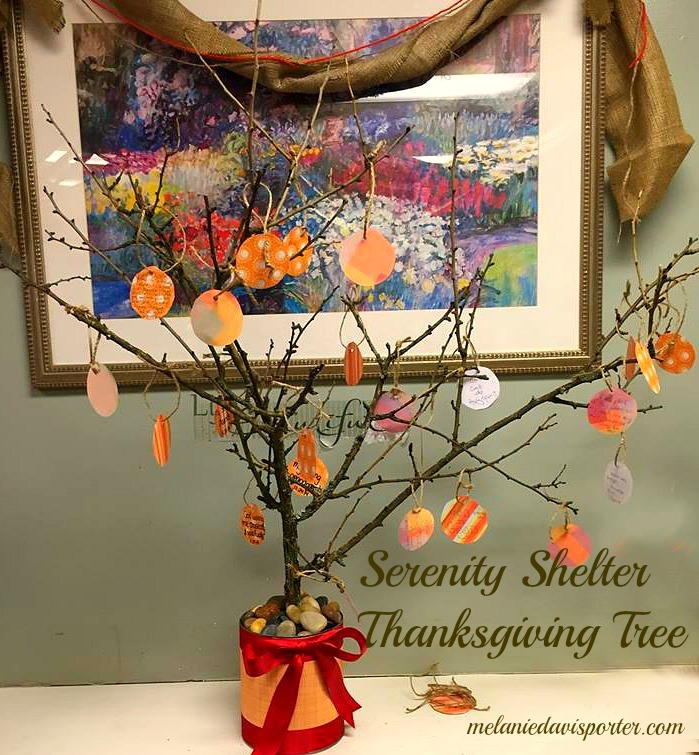 This month we took a THANKSGIVING tree to hang ornaments of gratefulness on. It struck me it could easily be a TESTIMONY tree. Reading the ornaments made my heart swell…..much like the Grinches crusty heart did when the “Whos” showed him unconditional love. I find myself thinking about these ladies all the time. We go to love and encourage them…. We come out loved on and encouraged. They are so grateful we come. It’s ever so obvious they love us too. Cassandra came in late from her job having missed the opportunity to share what she was thankful for earlier. As we stood holding hands for prayer to end our evening, she spoke with humble eloquence. The humility in her voice as it cracked literally split my heart. Earlier in the evening I prayed with four other ladies ranging in age from 20 ~ 55 years old.. The prayer requests were not of the material means….instead they consisted of…. Restored relationships and Salvation for their families…. Freedom from addiction for their families…. Requests for favorable results for upcoming educational testing, court dates, custody hearings. They weren’t ashamed to share how long they had been sober…clean…..drug free. I marveled in their humility wrapped in gratefulness. Their stories are not pretty by any means…. In fact their stories are shocking to someone like me who lives in a bubble. Yet they shared….unashamed of their brokenness….with ugly details….ugly facts….ugly consequences. Transparency is key to humility. 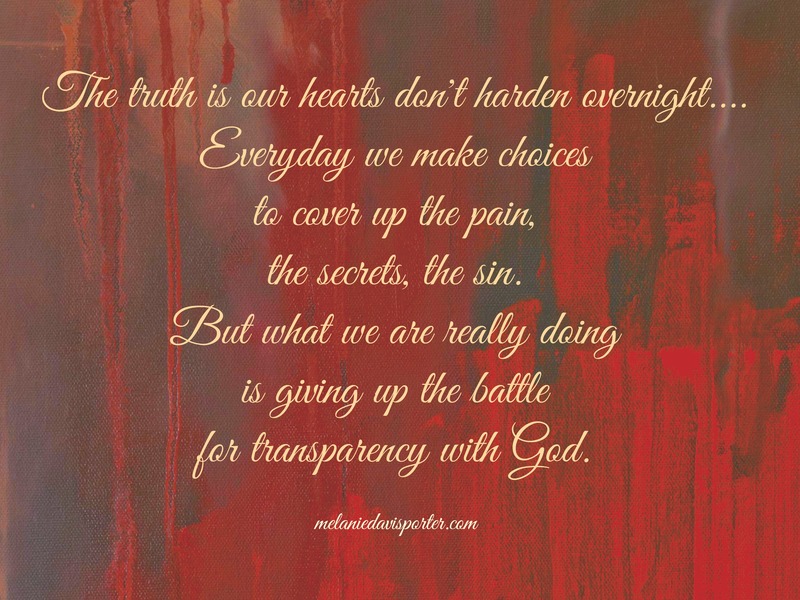 Transparency is necessary in GOD’S eyes. I can’t help but think about the ugly details in my life…the ugly facts…the ugly consequences. I am not so brave to share such things with my sisters. Pride keeps GOD at a distance in our lives. Pride hinders the SPIRIT’S desire to work in and through us. Is there a broken place in your life GOD worked for good? Are you ashamed to share it? When we hide our broken stories…. 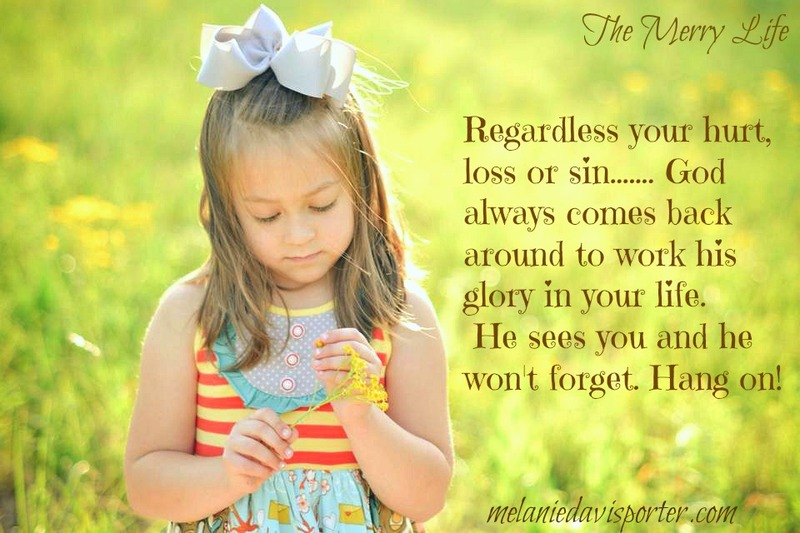 We deny HIS work in our lives…. This THANKSGIVING can we lay down the pride? Can we allow GOD to work through our ugly, sordid brokenness? Can we let go of the shame of our weaknesses and let GOD do HIS work? HIS will? Can we ignore Satan’s attempt to silence our stories? Can we start living transparent in JESUS CHRIST? We keep too many struggles secret…..yet we probably all struggle with the same things…. doubt, greed, jealousy, hate, bitterness, lust, selfishness, insecurity ….and the list could go on and on. In this 5 day series of THANKSGIVING I have challenged you each day to do draw closer to the GIVER by thinking different…being different…engaging GOD in a different way. I can think of no greater way to start engaging GOD ….than laying down our pride and letting HIM have HIS way with our stories. 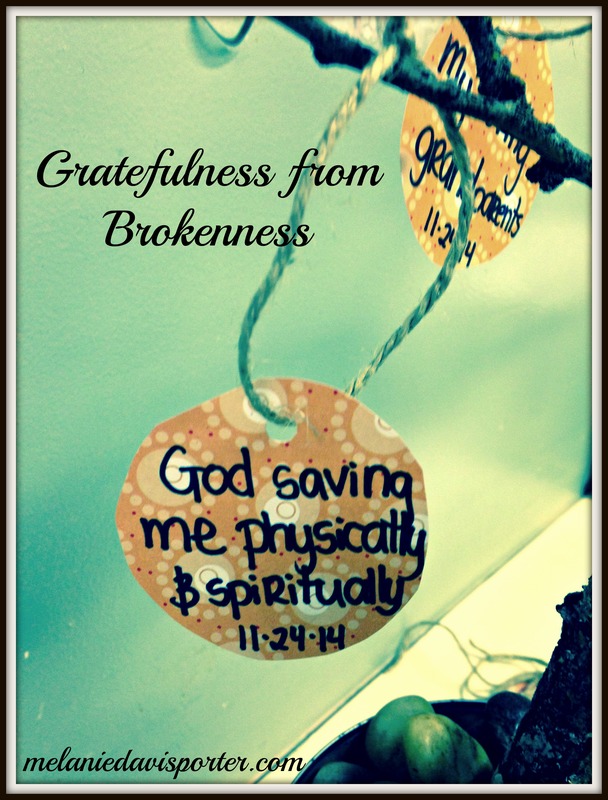 Instead of being ashamed of your places of brokenness…..
Be THANKFUL for the GLORY GOD has worked in your life…. What God’s done in your life that no one can see on the surface. The truth will set us free….. 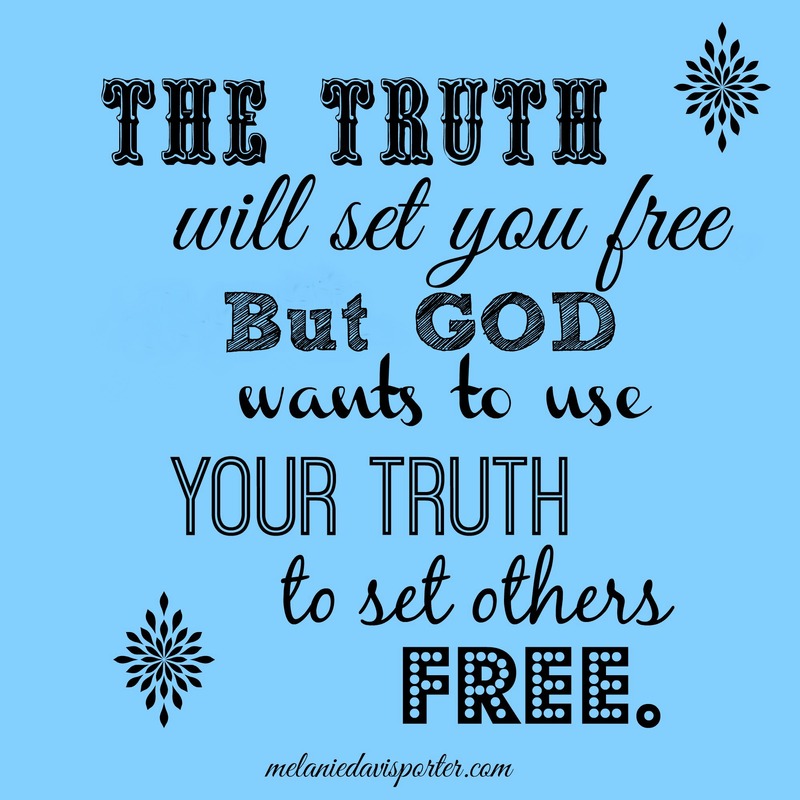 But GOD wants to use our truth to set others free as well. May you engage JESUS in a way like never before. To worship our LORD please click this link from the Elevation Worship Team. Ask GOD to give you the boldness to share the broken places in your life. Are you a person of vision? Do you live life with the expectation of GOD’S deliverance? Our attitude often determines our faith. If we have a rotten attitude…..
Often times our faith is weak. When our faith is weak it’s hard to see life through rose colored glasses so to say. Some of us are so beat up by the world. Maybe you are existing day in and day out in a state of acceptance of your situation. We’ve become resolved to living in defeat. We wallow in the past…..
Wishing we could go back…. But friend, going back will only set you back. The good news is GOD is always working your redemption story. 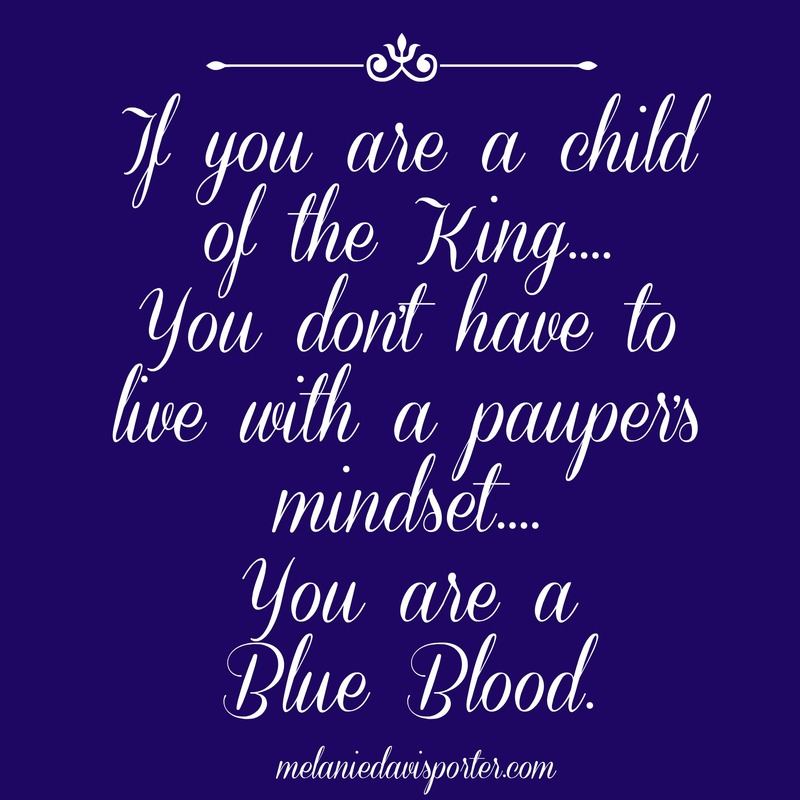 You are a child of the true KING, you don’t have to live with a pauper’s mindset. You are a blue blood! Though you are living in a place of life that is disheartening at times…..
As a child of the KING, we need to be living with expectation of what HE will bring our way. If we have experienced victory in the past…. We will have victory again. If you have seen GOD do amazing things in the past…. You will see amazing things again. There is a story in Luke of a Prophetess named Anna. She was a member of the faithful remnant of Israel who was waiting for the Messiah. She was over a 100 years old, living and serving in the temple even in her old age. Yet she anticipated better days. She daily lived with the hope and expectation there would be a Messiah born to save her people. In Luke 2, Mary and Joseph bring JESUS to the temple as an infant, to be presented to the LORD. GOD revealed to Anna who JESUS was…..the scripture says…. Oh friend….Is there a situation that needs to be redeemed in your life? Start living and believing in the expectation of the KING’S arrival to redeem you. Living in anticipation of what the LORD is going to do is a faith attitude. Living in expectation of the LORD’S deliverance is a hopeful surety. Be THANKFUL for the anticipation of redemption…. Be THANKFUL for the expectation of the KING’S arrival. To worship the KING click on this link and worship with Elevation Worship team. Close your eyes and anticipate the KING’S presence in your life. Do you ever turn up the radio when a specific song comes on? What about the song taking you back in time? A simple lyric or bass line can evoke emotions and memories catapulting us to either another place in our mind. It’s amazing the powerful effect music can have on our emotions. We can go from happy to sad in a New York minute and back again. Our Creator cleverly designed music to move, influence and give pleasure. I know music is a major part of my life. I’ve been told I came out of the womb singing. Because music means so much to us, it stands to reason our creator loves music too. Over and over in the scriptures we see our bible heroes use music as a means to worship GOD. In 2nd Chronicles 5 we learn the men of Israel congregated with King Solomon to celebrate the Ark of the Covenant’s arrival. In celebration they made continuous sacrifices, had feasts and played music. The LORD was so moved HE filled the temple with a cloud. So if the LORD loves music…. Do we sing to HIM only at church on Sundays? Do we just turn up the radio on the Christian station and sing along? I believe the LORD wants HIS children to be more intentional with our worship. When our heart is in tune with HIS….nothing can be sweeter than to offer a simple song of worship. You see…..worship isn’t about standing and singing with the congregation on Sundays. It’s not singing along in the car either…. It’s about offering our self in different methods of worship, with a sincere heart. We know our GOD is a GOD of variety and creativity. Just like we want a variety of choices in our meals….. HE desires diversity in how we worship HIM. When we do the same things all the time we can become complacent. We have a tendency to get bored. We react and respond out of habit. Our focus can be meaningless. I believe GOD craves a variation of ways to worship from HIS children. Some may not be musical…. elegant orators….or writers….but GOD does not care about our skill level. HE cares about our desire to praise HIM in a specific way pleasing to HIM. Do we care enough to offer a sincere chorus of song in our quiet time? 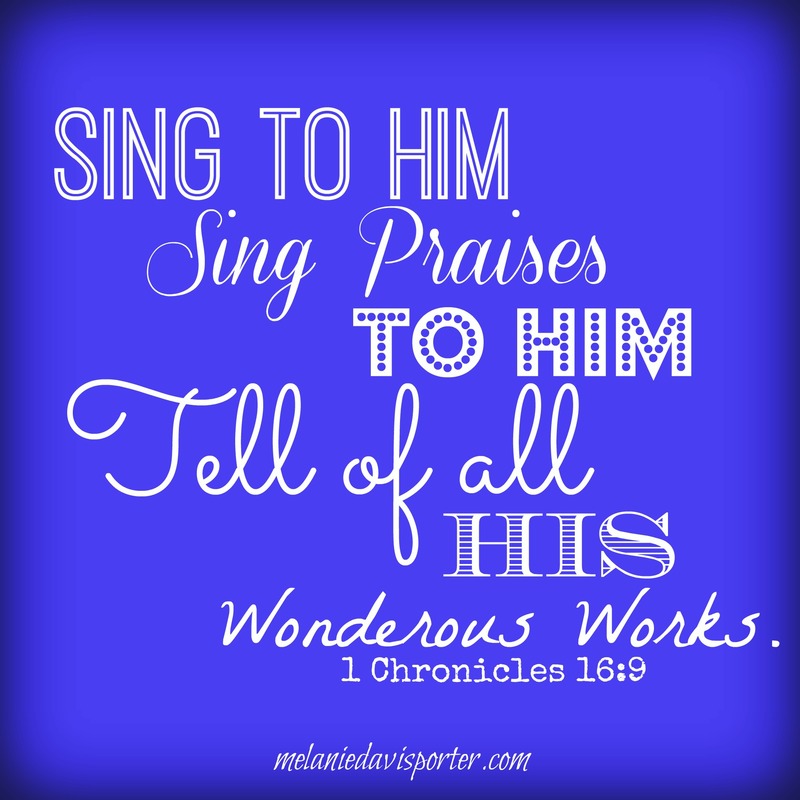 Do we pen our own words of Praise from a grateful heart….lifting up HIS name for all HE does for us? Do we read Psalms aloud to HIM? Do we lift our hands lauding HIS mercy over our lives? When we “DO” worship like this…..it’s intentional. 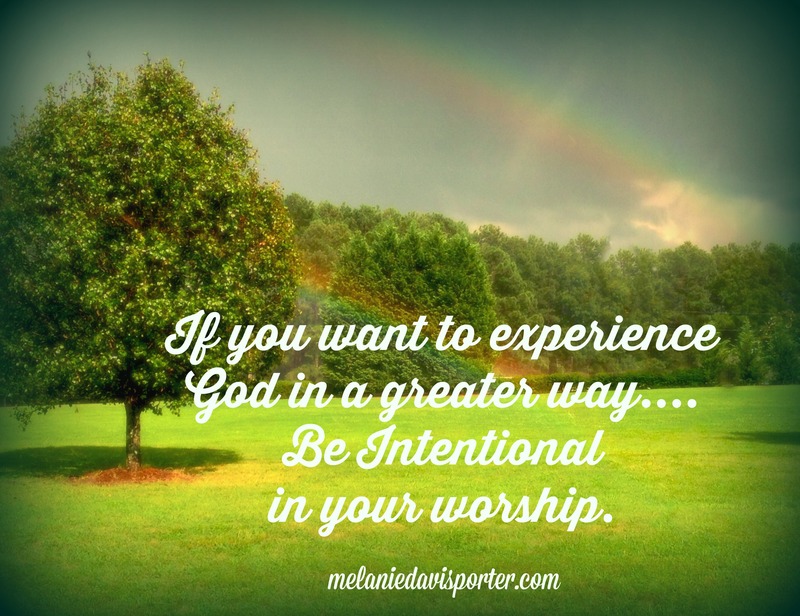 Being intentional with GOD is personal….it’s not cookie cutter worship. Sincere praise from an intentional heart celebrating GOD is a sweet sacrificial offering. I challenge you this THANKSGIVING…. 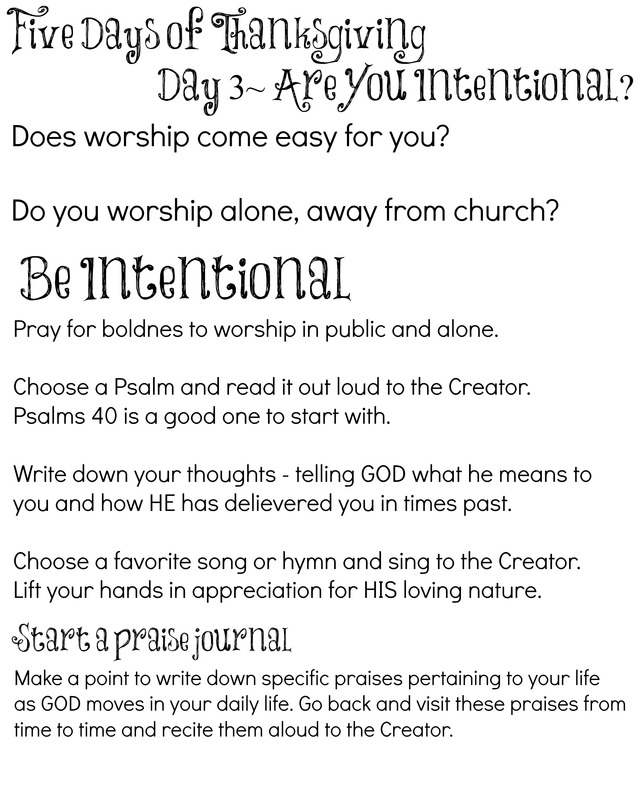 BE INTENTIONAL in your worship. Sing HIM a sweet song. Write HIM a love letter of praises. Let HIS presence fill your spirit…. For then you will experience GOD in a new way. To worship click on this link to hear the Elevation Worship Team. Close your eyes and absorb the words as though they are coming from your heart to the Saviour. They were the outcasts of society. Man’s fear robbed them of friendship…. Ten lepers taking comfort in each other’s flesh rotting company. This was their way of life…. Until the ONE who could change it all walked into their village. Their miserable existence made them hope. They wanted something more than the woeful life they were living. How similar we are to these 10 lepers? We live in a constant state of rotten, murky messes. We long for just a little relief. Just like the leper’s disease kept them at a distance…. We pray and ask for a change…. Some days we pray a little harder because we feel a little bit stronger…. Then tomorrow we wrestle with doubt….almost to the point of giving up. Some days we are convinced our situation will never change…..
Do we let the ache in our soul defeat and keep us at a distance from the Master? It’s all the more important we keep calling out to HIM…. And keep hoping with all hope that today is the day HE will answer back. If we don’t stop calling out to HIM. HE will answer in the way best…. This THANKSGIVING your circumstances may be far from celebratory….. But JESUS, MASTER is so worthy of celebration. HE deserves our THANKSGIVING even though our lives are imperfect. Nothing is wasted…the tears….the pain….the hardships. It will all result to a greater good in your life….. So thank HIM even when you don’t feel it. 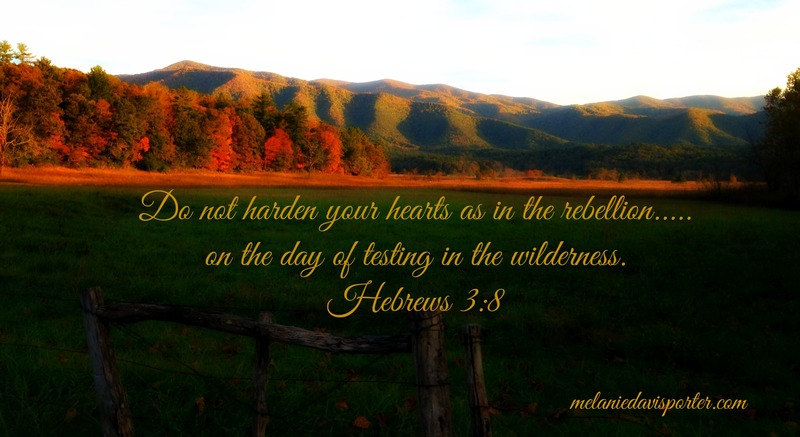 The next verse of the story in Luke gives us reason to keep calling out to HIM….. While on their way…they became clean…. And HE will answer you friend. The only constant in this life is JESUS, MASTER. Isn’t HE alone reason enough to be thankful? Keep giving HIM thanks even in the midst of the most difficult circumstances…. 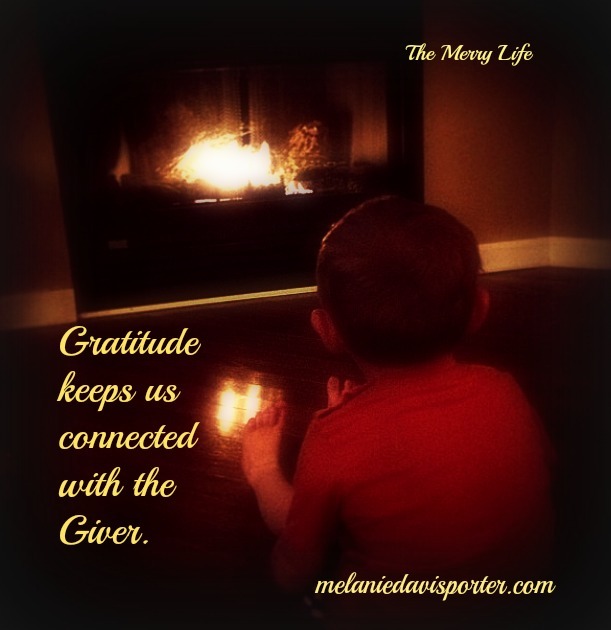 To draw closer to the giver click on this link Close your eyes. Listen and absorb the words as though they are coming straight from your heart….and calling out to HIM. You are cordially invited to join me in shaking things up a little this THANKSGIVING! I want to do THANKSGIVING different this year. I want to think different…. Do you have a tendency to do things the same way out of habit? I recently read that scientists call this practice a “heuristic bias”……and it can result in doing things in a mindless manner…..where we just do something without thinking about it after a while. Do we practice THANKSGIVING with a heuristic bias? Do we practice living this way? Do we practice love this way? Do we stop and actually think about what we are doing or is life predominantly lived out of left brained habits? I am desperate to hear from GOD and because of that….. I can’t just open my bible and read a few chapters….. then pray. Oh no….this habit …though better than no spiritual habit…will not suffice the hunger HE has placed in my soul for more of HIM. Living out of habit makes us forget the important things. Living out of habit makes us self- reliant. Living out of habit makes us spiritually barren. Oh my friend if you want to hear HIS voice….. I encourage you to engage HIM in a different way of thinking. 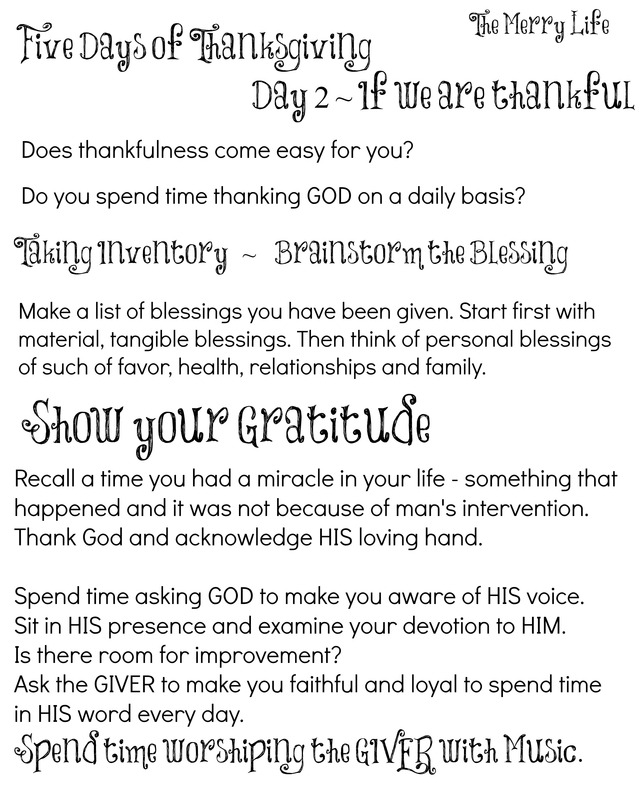 In Five days of THANKSGIVING…. I’m going to think different…. I invite you to join me in CELEBRATING AND THANKING THE GOD WE SERVE! Submit your email address on the sidebar of my blog and starting tomorrow you will receive a Thanksgiving devotional to challenge your thinking and hopefully inspire you to do THANKSGIVING different this year. 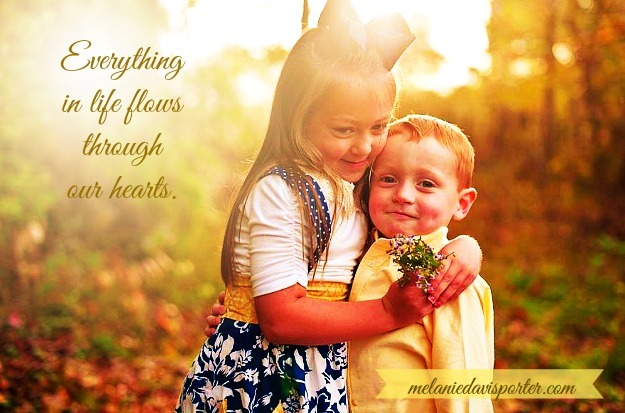 My story…..is tightly woven into my love story. 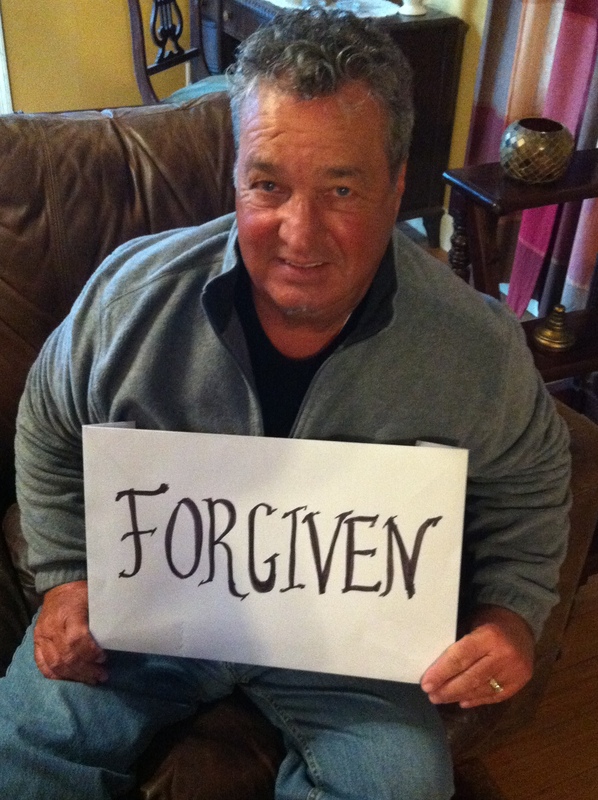 What a man…what a GOD…and oh what a story of FORGIVENESS. I am recycling an old post to link up with the precious Suzie Eller for #livefree Thursday. He was barely 19 by just a few days when he received his mandatory invitation from Uncle Sam. Life was simple….. but he was far from a simple boy. Talent, smarts and personality oozed from every pore of his body. Required to report within 21 days, he left his boyhood behind. After 12 months of combat training he stepped off the plane in Chu Lai, Vietnam. All he could see on the tarmac were thousands of body bags laying side by side for three lengths of a football field. He told himself he would never make it home. His boots hit the jungle ground running. His daily goal was just to survive to see the sun rise. He once went 3 weeks without taking his boots off. He said you didn’t want to get caught with your boots off. When he finally removed them ….the medic had to strip the socks from his skin. The noise was miserably deafening. The sights were horribly unforgettable. The emotional and physical stress took its toil…. He had his first taste of liquor to cope. One by one he watched his friends die. He was one of the lucky three that survived his squad. The tactical missions occupied his mind….. Shifting his focus from the prospect of death. Once after an intense night of battle…. He carried a dead GI on his back until he met up with the medi-vac helicopter. You never forget that kind of weight….he says…. It’s a weight that lays heavy in the mind…. It’s a weight you still feel 44 years later. Every 3 weeks his squad would go to the rear, aka command base, for a precious 3 day rest from death and destruction…. That’s where he learned to drink in order to numb the stress. He laughs about one soldier who actually tried to fake being crazy….. These were the ones who would suffer being a coward rather than face the alternative. The gruesome images he saw….are still prominent in his memories. The desperation of surviving affected him in ways he could never imagine. There are times he is still in survival mode even today. The shock of all his senses engrossed in the worst horror story you can imagine…. Is who he is….at the most unexpected recollection. They patched him up and sent him back to the jungle a few months later. Fighting for a people who for the most part…. He managed to come home…. But he wasn’t the same simple boy who left at the tender age of 19. He came home and turned to alcohol more and more. He worked hard and long hours during the day….. He partied hard and long hours into the night…..
Every hour of productivity or leisure was occupied with anything to ease the memories. I met him in 1985. I didn’t know it then….but he was still broken from the war…. 15 years later. He was a functioning alcoholic. He was the life of the party…. 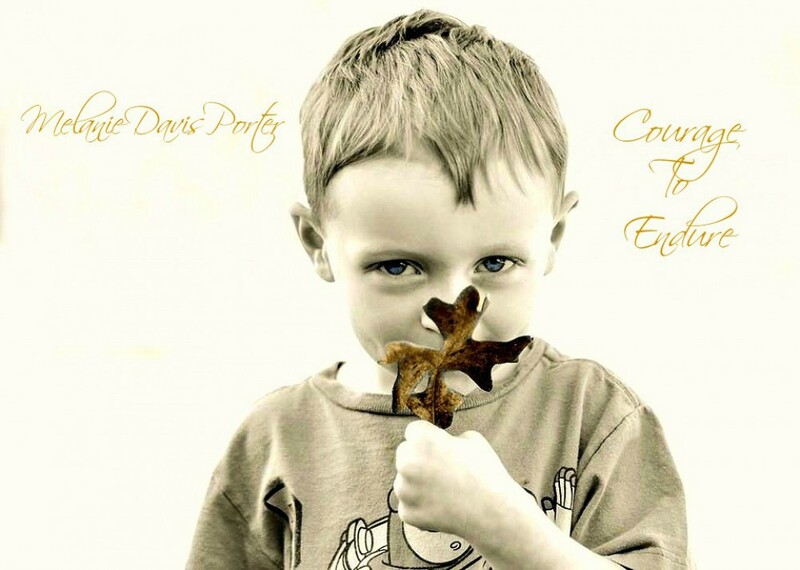 The party was getting old to me…. Especially after the first baby came on the scene. I just wanted to be normal…. But he couldn’t give me normal because he was carrying the weight of an unresolved emotional trauma. Statistics cite severe drug and alcohol problems for 60-80% of Vietnam veterans. Divorce rates hover around 90 percent. Somewhere around 58,000 Vietnam vets died in combat…. Over 150,000 have committed suicide since the war ended. Over 500,000 have been arrested or incarcerated. It is estimated that approximately 100,000 are in prison and over 200,000 are on parole. These 800,000 men will never get back what they lost. They will never know normal…. At least in the way it was before it was taken from them. My veteran gave up so much promise…. So many dreams that have never been reborn. He lived with years of pain…. Until it all caught up with him…. And the self-destructible behavior cost him everything. You see that’s what happens when we can’t cope with the pain…. The horror of the past…. 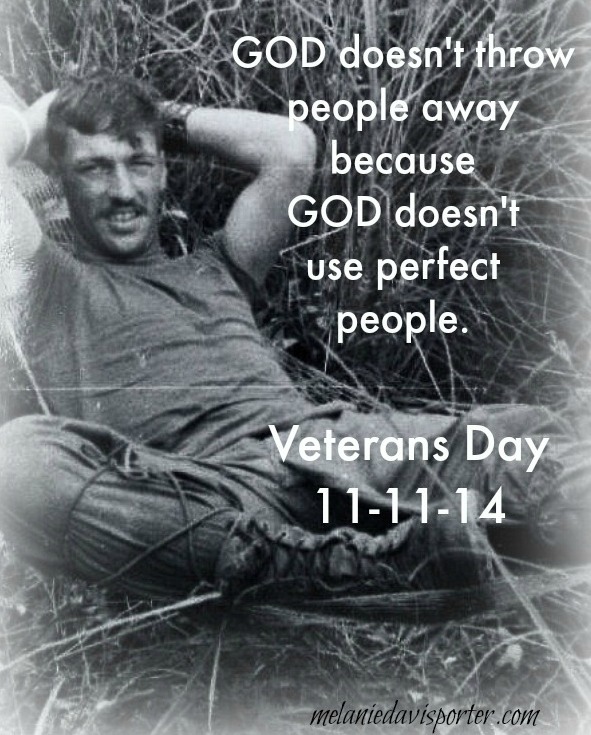 Interceding prayers made the difference in my vets life. There were numerous….a too many to mention, faithful prayer warriors…..who prayed for him. When he could bear the burden no longer…. When the bible talks about a new creation being born at salvation…..
My vet instantly became a new creation. What an undying love from a faithful young bride couldn’t do….. Nothing the world could offer helped him in anyway…. Immediately his countenance was different. I will never forget the conversation we had a few years back….. He talked about how the LORD had removed all the guilt of what he had to do to survive the hell hole of Vietnam. “All that guilt…and worry….the faces I used to dream about…it’s all gone, GOD took all that from me when he saved me, I am FORGIVEN,” he said. GOD also took his desire for alcohol away. He has been sober for 23 years. What GOD has done in his life is nothing short of a miracle. He is far from a perfect man….. But he lives a spirit filled life of joy…. And though life is hard at times…. JESUS helps us live daily with love, laughter and vision for the future. 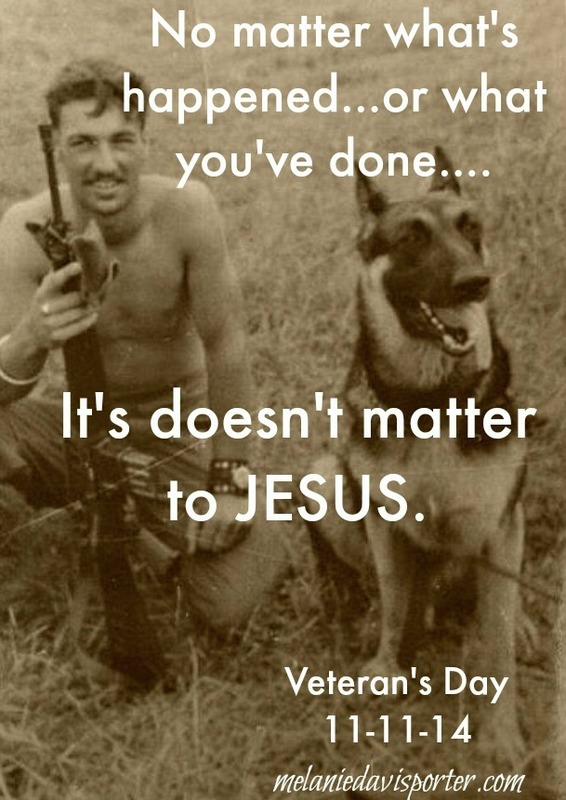 And now JESUS uses my vet for HIS kingdom…. He witnesses and helps others struggling with alcohol…. He goes and prays with those who need a touch from JESUS…. He has led several in the sinner’s prayer. GOD doesn’t throw people away…. Because GOD never uses perfect people. No matter what emotional trauma you have suffered…. No matter what addiction or stronghold in your life…..
No matter if divorce happens…..
No matter the mistakes you’ve made with life changing repercussions…..
You are a new creation….. This past summer I heard a quote at a Proverbs 31 Women’s event and it gave me such hope…. 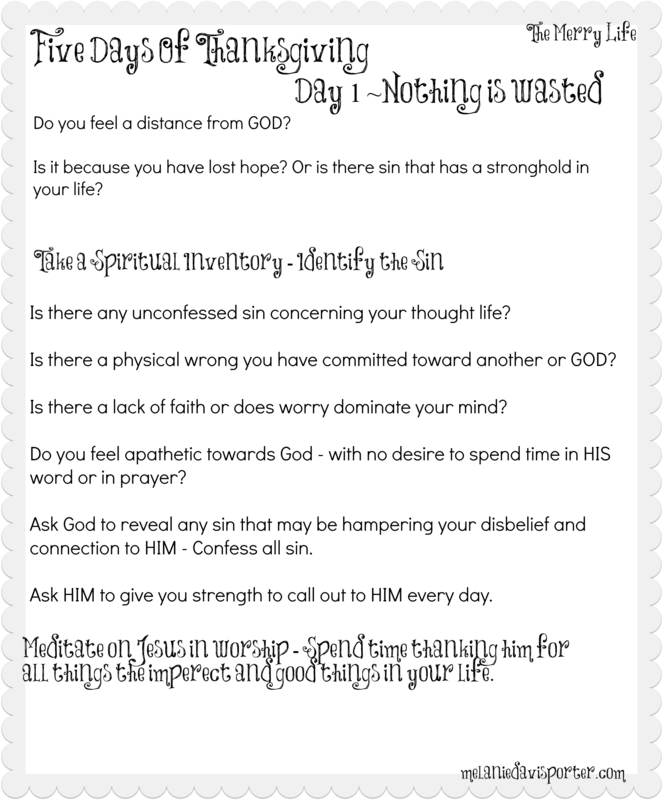 Won’t you surrender to JESUS today and you can be FORGIVEN too? If you have never accepted JESUS as your savior….there is no better day than today to become a new creation! Please follow this link …..It’s so easy to come to JESUS!